Preliminary Chart No. 3 of the Sea Coast of the United States from Cape Small Point Maine to Cape Cod Mass. 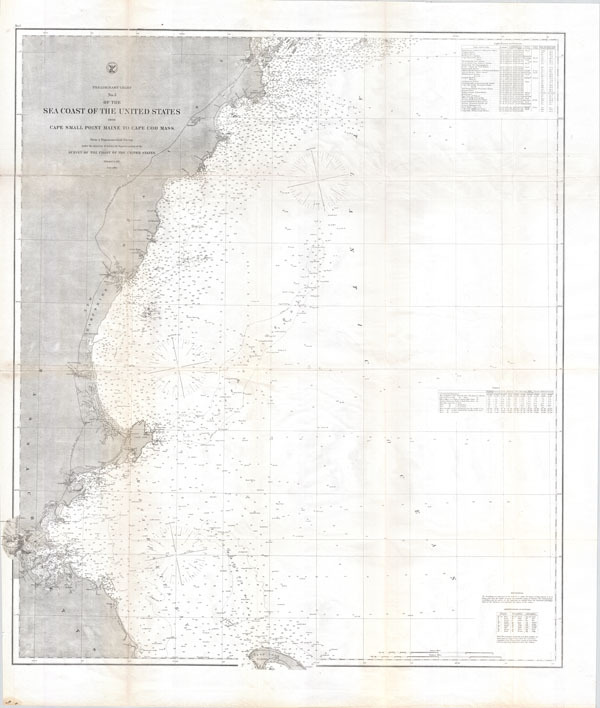 An impressive and striking example of the U.S Coast Survey's Map of the New England Coast. Extends from Cape Small Point, Maine, south to Cape Cod, Massachusetts. Includes Boston City and Harbor, Salem, Provincetown, Cape Ann, Gloucester, Newburyport, Portsmouth and Portland, among other towns. Offers limited inland detail, but does show several cities as well as the course of the Portsmouth-Portland and Eastern Railroads. From a nautical perspective the map offers a wealth of depth soundings and information on shoals, light houses, and tides. This chart was prepared under the supervision of A. D. Bache, one of the most influential Superintendents in the history of the Coast Survey. Issued in the 1867 supplement to the 1865 Superintendent's Report.